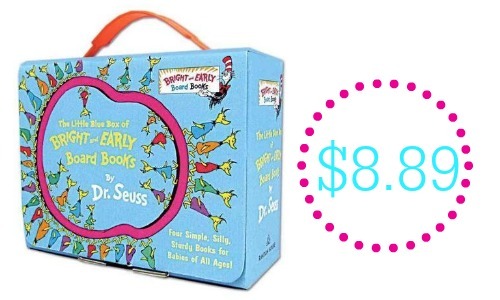 Amazon and Walmart are offering The Little Blue Box of Bright and Early Board Books by Dr. Seuss for $8.89, regularly $19.96. The set includes (4) popular board books including Hop on Pop, Oh, the Thinks You Can Think!, Ten Apples Up On Top! and The Shape of Me and Other Stuff. These make great gifts so grab some for the gift closet or put them on the bookshelf for story time. Choose FREE in-store pickup at Walmart to avoid shipping costs or FREE Shipping to Prime Members with $35 purchase.